The most common form of bundle-branch reentrant tachycardia is caused by circulation of the excitation wavefront up the LBB, down the RBB, and then through the interventricular septum to reenter the left bundle (32) (Fig. 3). Because the ventricle is depolarized from the right bundle, the tachycardia has a LBBB configuration. Occasionally, the circuit revolves in the opposite direction, giving rise to tachycardia that has a RBBB configuration. Rarely, reentry occurs solely through fascicles of the LBB (33,34). Sustained bundle-branch reentry usually requires abnormal, slowed conduction through the bundle branches. The surface ECG during sinus rhythm often displays incomplete LBBB, or occasionally a pattern of complete bundle-branch block (BBB). 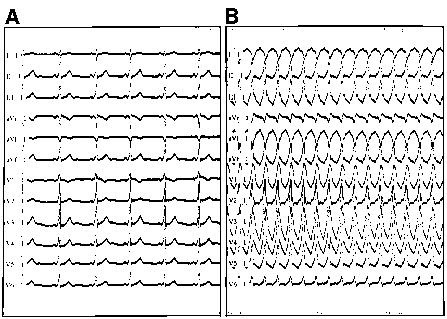 In the latter case, conduction through the left bundle is actually possible, but is so slow that conduction over the right bundle alone depolarizes the ventricles during sinus rhythm.